NOTE: There is a small shape of the country of Switzerland off to the side of the sun on the actual poster. We will be updating the poster’s image soon to reflect this aspect of the poster. 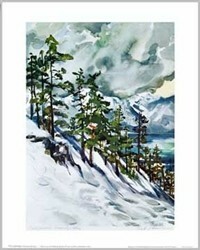 1948 Winter Olympics again took place in St. Moritz, Switzerland, as it had 20 years earlier. There had been a 12-year lapse since the last Winter Olympic games, due to the events of WWII. 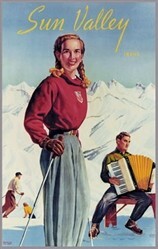 The games of 1940 and 1944 had been canceled. 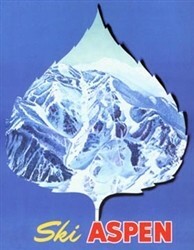 All were happy to return to neutral Switzerland to once again compete with the athletes of all nations. 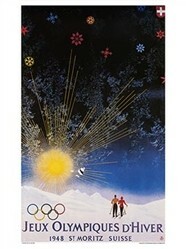 This is a beautiful reproduction of the official poster of the 1948 Winter Olympics.